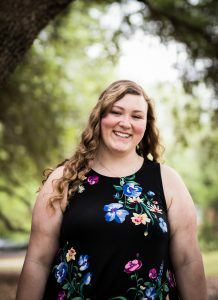 Senior Spanish and French major Emily Pressler has been awarded a Fulbright English Teaching Assistant (ETA) in Spain for the 2019-2020 academic year. Pressler’s placement will be in Galicia, Spain, and she will assist primarily in English classes for students who speak Spanish, Galician, and English. 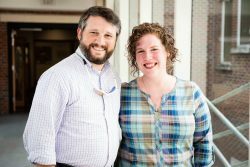 She is the first Georgia Southern student to be awarded a Fulbright ETA since 2014. Pressler is a student in the University Honors Program, and she recently completed her honors thesis, “Hispanic Stereotypes in Contemporary Film.” Her coursework in Spanish and French gave her insight into language-learning and a variety of approaches for engaging language learners in the classroom. “I am really excited to start teaching. I have had experiences tutoring and volunteering as a teaching assistant, but this will be a real chance to see how to organize and to teach a class, working closely with the teacher,” she said. Pressler also is no stranger to embracing new surroundings. She is originally from Southold, NY on Long Island and came south to attend Georgia Southern. She also participated on the Honors Program’s alternative break trip to Costa Rica and spent summers studying abroad in Spain and France. She said she is very much looking forward to exploring the Galicia region in Spain’s northwest corner. After her time as a Fulbright ETA, Pressler plans to enroll in a master’s program for teaching Spanish, with the goal of teaching Spanish, and possibly French, at the high school level. Soon-to-graduate Honors student Mary Kate Moore (experimental psychology ’19) will be able to add one more entry to her curriculum vita this June: a publication as lead author of the article, “George Berkeley Through History: Multimodal Perception from the 1700s to Present.” The article is coming out in the North American Journal of Psychology. What began as a two-page topical paper for her History and Systems of Psychology class in 2017 turned into a 17-page publication on multimodal perception, or the idea that all our senses – visual, auditory, sensory and more – work together to create one’s perception of reality. The original assignment was to select a figure in history – in Moore’s case, George Berkeley – and connect their ideas to modern research. In respect to multimodal perception, Berkeley championed the idea that there is a correlation between sight, touch, and previous experiences, and humans interpret the world through the integration of these inputs. Moore focused her paper on the points in history where Berkeley’s idea was used – knowingly or not – and showcased how his idea has persisted through time and has even been supported using today’s available technology. The journey from two-page paper to full-blown publication was, naturally, a laborious one. “Difficult would probably be the best word I could use to describe it,” Moore said. Once Moore began writing the article, she ran into quite a few obstacles, including writer’s block and how to best organize the article. In addition to Moore’s work ethic, Williams also attributed some of her success to her involvement with the Student Scholars Symposium. “She’s an accomplished speaker,” he shared. “Higher-up presentations at [field-specific conferences] are now old hat.” Moore has presented her work on this subject at a previous Student Scholars Symposium and the Southeastern Psychological Association conference last year in fulfillment of her Honors project graduation requirement. In the future, Moore would like to focus on research into multimodal perception with an applied perspective as opposed to theoretical. “Multimodal perception is my baby,” she explained. “I think it’s fascinating.” She already has ideas in mind for possible experiments but confided that she may have to wait until she’s earned her Ph.D. before delving even further into the subject. Julia Thomas in the archives. While eating your shrimp basket with fries, do you ever stop and wonder how that seafood arrived on your plate? Perhaps it was caught locally. Or maybe it was imported from another part of the world. Or even raised in a fish farm. Julia Thomas (anthropology ’19) has spent the past three semesters researching and interviewing fishers, particularly shrimpers and crabbers, in southeast Georgia who supply seafood across American and Asian markets. Her research focuses on the fishers’ relationship to larger commercialized fishing corporations. Thomas recently had the opportunity to present her honors thesis at the 79th Annual Meeting of the Society for Applied Anthropology in Portland, Oregon. She worked under the mentorship of Dr. Jennifer Sweeney Tookes whose oral history research team she joined last March. The oral histories conducted on that research trip were recorded and will be uploaded to the National Oceanic and Atmospheric Administration’s (NOAA) Voices from the Fisheries database which is available to the public. As her mentor, Dr. Tookes aided in developing the topic, reading drafts, making edits, and providing support in Thomas’s endeavors. Dr. Tookes praised her student and recognized her strive and commitment. “Julia Thomas has completed intensive, independent anthropological research that rivals the work of many graduate students. She has completed an ambitious project, and it has been a pleasure to serve as her undergraduate honors thesis advisor,” she said. The conference gave Thomas the opportunity to share her finding with scholars in her field. While Thomas has presented posters at conferences before, Portland was her first experience with an oral presentation. “I had only done poster presentations, so this was a whole new experience. It was fun to attend a conference more related to my major and thesis. Dr. Tookes introduced me to a few of her colleagues who attended the session I presented in. 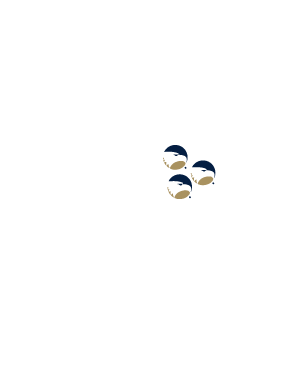 It was nice to meet people whose research relates to my thesis and know so much more about fisheries than me. There were also a few people in the audience whose works I cited in my thesis. I was able to put a face to the name and meet people whose research I have read and used in my work,” Thomas said. During Thomas’ four years at Georgia Southern University, she has been an active member of the anthropology community on campus. She is a member of the Anthropological Society and Vice President of Lambda Alpha, a national anthropology honors society. “In Lambda Alpha, the officers and I lead and organize meetings and host events like our Anthropology Spring Film Series. Most recently we showed Secrets of the Dead: Herculaneum Uncovered, and 82 people attended. We are also currently planning an end-of-year departmental event in collaboration with the Anthropological Society,” she said. Thomas also volunteers in the archeology lab, in the Carroll Building, for several hours a week. She works with graduate students and staff, helping in organizational projects. “Last semester, I helped organize and rehabilitate a collection we got from the Armstrong Campus. It was from the 1980s and 1990s, and we went through approximately 80 or so boxes of archaeological material, creating inventory forms for each box and re-bagging artifacts when we need to. We also worked on some of the zooarchaeological comparative collection, mainly by cleaning and rinsing off specimens when they were ready. 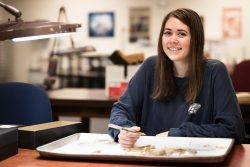 This semester, we have re-boxed and stored another collection from Armstrong and are currently in the process of cleaning, sorting, and bagging artifacts donated to us from a collector,” she said. “After conducting research, I am most passionate about the fishers. Before doing this research, I knew next to nothing about commercial fishing and the industry in Georgia. Now, I have so much admiration and respect for the fishers and other people in the industry. It is such dangerous, risky, difficult work, but they love it anyway. Hearing how much they enjoy fishing and listening to their stories is so inspirational and they are such an incredible group of people,” Thomas said. Honors Students at camp. L-R: Mariah Arnett, Delaney Grim, Seth Davis, Niesha Bell, Sarah Martinez, and Christina Sartain. 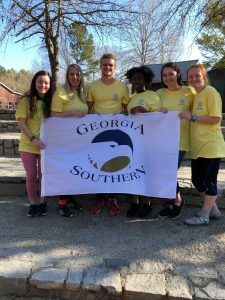 In what has become a spring break tradition, Camp Blue Skies comes to Camp Twin Lakes in Rutledge, Georgia—a camp especially designed to support campers who face medical, adaptive, and other life challenges. Dr. Jerri Kropp and Dr. Brent Wolfe led a group of 16 students to volunteer as cabin counselors and activity leaders for participants in Camp Blue Skies, a camp for adults with developmental disabilities. Our students go through some intensive pre-camp training, including training on-site a couple weeks before camp. Grace Pittman with her mentor, Dr. Joshua Kennedy. 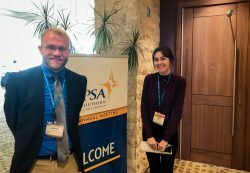 Grace Pittman (political science ’19) had the opportunity to present her honors research at the Southern Political Science Association (SPSA) in Austin, TX. Her thesis, “Better Left Unsaid: The Connection between Members of Congress, the President, and Political Ambiguity,” examines the lack of direct support from politicians for specific programs or views. “My thesis concerns the ambiguity demonstrated by members of Congress based on the president’s popularity. Ambiguity, simply defined, is a deliberate refusal to be clear about what it is one supports. It is a political tool for members of Congress. Remaining silent about their position on political issues, especially ‘hot-button’ issues, allows congressional members to maintain the support of their voting bloc and potentially win over more voters,” she said. Pittman discovered that there was little to no research on potential candidate’s ambiguity. Her research is adding to the scholarly discussion for political science. She was able to provide a new lens of analysis for candidate behavior research. “Finding a topic that had never been researched mattered because I was starting from scratch. My argument had to be sound to justify my choice in topic. It is easy to flip on or scroll through the news to see and hear examples of politicians using vague statements or dodging questions when pressed by reporters on political issues. However, the challenge lied in proving it and explaining why they would do it. Therefore, my argument, represented by my theory and literature review, became central to my research,” she said. SPSA was Pittman’s second conference. Last year, she presented at the Georgia Political Science Association (GPSA). Both experiences allowed her to gain experience in the professional world of academia. Pittman presented her findings to a room full of scholars with graduate degrees, whose specializations were related to researching politicians’ behavior. “My audience, in comparison to GPSA, was slightly larger, and I feel almost certain that everyone in the room had a Master’s or Doctoral degree. It was intimidating. Everyone in the room knew the ins and outs of what I was discussing. However, midway through the presentation, my nerves seemed to dissipate a bit, and I was pleased with my execution at this conference,” Pittman said. Conferences give students the opportunity to expand their professional connections through engaging conversations with scholars in their field. Students are putting their ideas, thoughts, and analysis into the discussion. The reward is the advice, suggestions, and support that follows. Her experience with the University Honors Program has allowed her to challenge and to grow her academic skills in the classroom, with her research, and at conferences. “The program requires a commitment to give 100% to your thesis and studies. Yes, there are good and bad days, but the attitude you manifest is the one that determines your likelihood for success. Honors is similar to a long-term investment. The payoffs are greatest for those who are serious and passionate about their work. Suddenly, your work, whatever it may be, speaks for itself, and there is satisfaction in that,” Pittman said.